This bubble was not pricked by the central bank — on the contrary. For a while, there was a rumor that first-time buyers would save the market, and that this was visible because in the big cities, such as Sydney, they could only afford to buy condos, and condo prices would hold up, it was said. 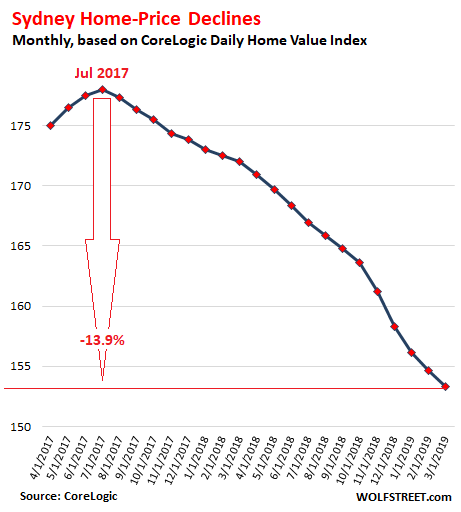 But condo prices are now rapidly catching up: the CoreLogic Home Value Index for condos dropped 1.2% in March from February and is down 8.9% year-over-year. In the Melbourne metro, the second largest market in Australia, the CoreLogic Home Value Index fell 0.8% in March from February, and 9.8% year-over-year. Prices in the most expensive quarter of the homes the sold dropped 13.9% from March last year. Although housing market conditions remain relatively healthy in these regions, conditions have noticeably softened over the past twelve months with values either slipping or the pace of growth slowing materially. The biggest longer-term drops among the capital cities happened in Perth, epicenter of Australia’s mining bust, where home prices are down 7.7% year-over-year and have plunged 27.5% from their peak in 2014; and in Darwin, were home prices fell 6.8% year-over-year and have plunged 18.1% since 2014. Prices are too darn high for average workers. After years of blistering price gains that have by far outrun wage gains, unaffordability hamstrings many potential buyers who’d actually live in the homes they’d buy. This removes a big part of the potential buyers. Enormous household debt, mostly related to housing, just as collateral values are now declining. In the fourth quarter 2018, the ratio of household debt to disposable income hit a new record of around 190%, among the highest in the word. The construction boom is dousing the market with record new supply, including a flood of new condos that has gotten the worried attention of the Reserve Bank of Australia. Resulting in tighter credit conditions. Banks are now scrutinizing borrowers more thoroughly, and as they have tightened up underwriting standards, liar loans and other shenanigans are more difficult to pull off. And regulators have cracked down on interest-only loans for investors. Consumer sentiment has soured on real estate, after years of ceaseless hype. The one factor that isn’t a factor is the Reserve Bank of Australia’s policy rate, which is at a record low, and mortgage rates remain near record lows. So this is not a bubble that got pricked by the central bank. On the contrary, the RBA tried to keep the bubble going back in August 2016 by lowering its policy rate to that record low. They will legislate affordable housing in the golden state, using rent control and block grants. For years we had the Redevelopment Agency program, which provided for retail primarily. The result was to drive commercial rents up. They shutdown the RA because the money was bypassing schools and infrastructure. Cities were using the money to build projects which brought in tax revenue without spending any of it, now they are mostly in good fiscal shape and the larger entity, state and federal will subsidize housing. In better coastal locations along the southern california coast, activity is brisk under 2M … for the right house, buyer demand fierce. Once you get way way way above 2M, slowness exists with definite discounts. Must be the tax law pushed everyone down the price ladder. That is my take. Same pattern in Boston, but even more demand below 1.5M. Crazy. No the new tax laws along with strict zoning laws will just push buyers under the 1mm range so there will be continued strength of prices from the 1br to the 4br condo/houses in socal. High prices are here to stay. Get in line. Canada first. I see it coming everywhere around the world. At the same time. Toronto RE sales are back at 2009 level. Much more room on the downside to come. – There is something missing in this list. – In the years 2019 (this year), 2020 and 2021 A LOT OF “interest only” loans will reset from “Interest Only” to “Principal & Interest”. That pushes yearly mortgage costs up higher by some 30% to 70%. – Australian households took out those “Interest Only” loans because real estate prices were already (very) high and households couldn’t afford to pay Interest and Principal. – But with the reset to “Principal & Interest” the chickens are now coming home to roost. – There is however one (small ???) silver lining. By paying down principal the amount of interest to be paid will shrink every year. But people who are able to survive the 1st year will do fine in the next years. 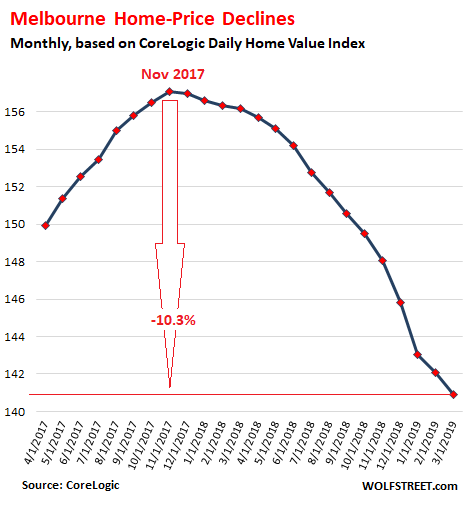 CoreLogic is already predicting U.S. home prices will rise a at healthy rate and accelerate due to falling interest rates since the Fed U-turn, starting this spring. I’m not seeing any weakness of note in the Boston area but then we’re heavily plugged into the War & Aggression Complex, Medicine, Financial Services, Education. Difficult to imagine home prices going up much. Average home price is $317,000 Median household income about $62,000. So, homes are about 5 times income. That’s pretty high. No mate, it isn’t — it’s back to 2016 levels, which no-one described as very affordable at the time. When prices shed the last seven years’ outsized gains they might be. Housing is not at all affordable… in socal.. middle class is fleeing away.. here only rich people and very poor people.. Looking at the median house value, $700k to $900k in major cities and around $500k for the other cities, how is that “very affordable”? These cheerleaders try to make believe that a decade of irrational exuberance changed the meaning of “affordable”. 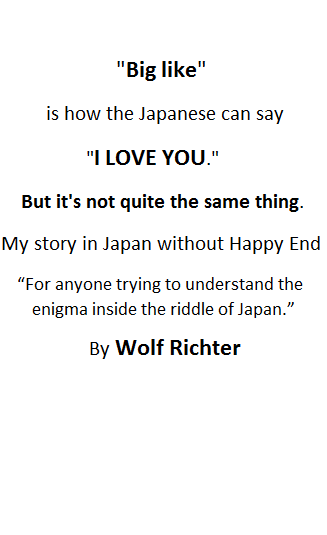 Thanks Wolf, that very astutely summed up what is happening in Australia and the causes. It is of note that the government there has been methodicaly driving down interest rates since 2011 and I think now dares not nudge them up because of obvious fears. Most likely they will devalue the currency as to spread the pain to all but save the whole network of overvalued loans but we’ll have to wait and see. Btw, thank you for the time and work you do to make these stories available to all. Something in common, Australia and Canada. The annual pace of mortgage growth in Canada has hit a brick wall, now at the lowest level in almost 36 years! While new home demand has performed a cliff dive! Or could it be that the paper we carry around in our pockets, along with that little plastic digital wallet, are just not performing like they used to do? Australia’s govt refuses to pass new AML laws. Probably to keep the bubble inflated. AML does not apply to real estate agents or lawyers or accountants. In the US, household mortgage debt, adjusted by CPI, is down 4% from Q1 2012 to Q4 2018. The number of mortgages is also down, but only by about 2%. Yet the average selling price is up 36%. In other words, the housing recovery has been driven largely by cash investors. If investors expect a significant dip in prices (rents, houses) they will be much more able than owner-occupants to sell…. So your cherry-picked dip from Oct through Jan data was minuscule (252.8-252.7 = 0.1). In February, which you conveniently didn’t mention, CPI rose to 253.1, above November. But also many households paid off their mortgages and paid down their mortgages. About one-third of homeowners own their homes without mortgages, and another third paid down their mortgages substantially. Your equation is missing this element. Excellent Article! Worth mentioning is the equity lost in Q1 2019 to the tune of around 130-140 Billion US, in a country with so much personal wealth tied in housing, that is not good for consumption GDP going forward… Canada is getting hit hard, but like Wolf pointed out, Australia Interest Only Subprimes is gonna be there downfall, on top of everything else. It’s amazing how pronounced the decline is, isn’t it. Its been almost 20 years since Australia had a recession. Its long over due. Jees there are THIRTY Black Swans! The AA (flak) might knock down 20 on their way in but I think a few will get through. Thirty? It would have been bad enough if he’d said in the top three. Does this mean there are worse situations? Well Oz although no minnow is not an elephant. Makes you wonder what his top pick is. Here they are: he says higher on list is more important. – and the lack of foreign demand for US credit. All are interrelated, however points #4 & 5 are very close cousins. The US Treasuries curve is dangerously close to complete inversion, which means nobody wants to buy in excess of 30 days. Hence the lack of foreign demand. If the US can’t sell it’s debt in the form of Treasuries, then the inflation such sales generate will remain in country. Taken in conjunction with many countries unloading their US Treasuries, thus deflating the amount of off shore US dollars. Case in point is Russia, that has drastically downloaded their amount of Treasuries and bought gold. These Treasury redemptions put further downward pressure on the US dollar, as the Fed must move closer to total monetization of the US government debt issuance, which does not seem to decrease, rather increase substantially, putting more pressure on the dollar. There is no problem in Australian housing. This is the perfect definition of ‘fake news’. 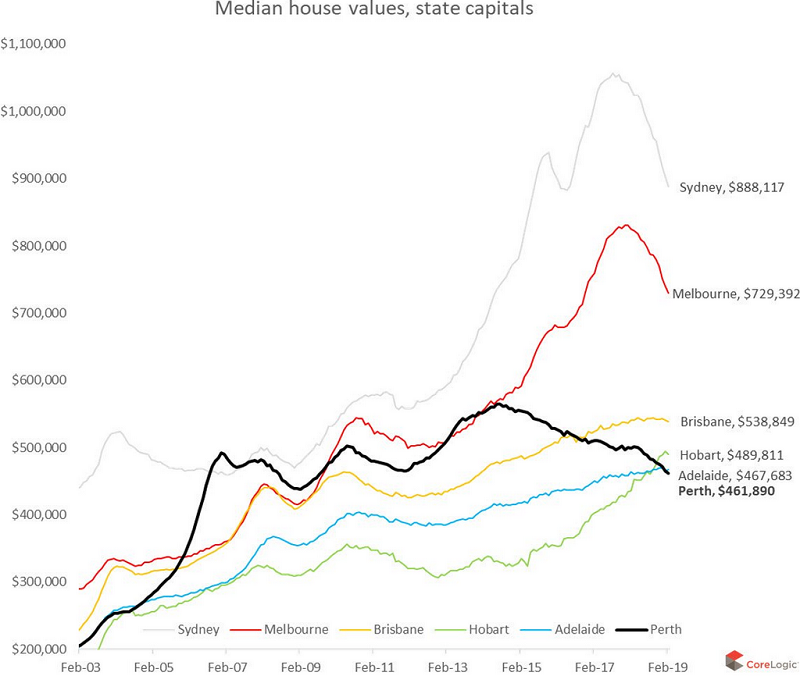 House prices in Australia are up heaps from a decade ago. A little fall as we’ve seen is going to have zero impact on anything. Excellent comment as always Wolf ,but with over the top [numbers] on emigration it is possible that a floor on housing could be obtained with government intervention . A national housing crash will be avoided at a cost, with a possible change of government before June 2019. The RBA has recently spoken about the idea of commencing QE if required due to a slowdown in the economy and the need for people to take on more debt. What affect would QE have on our currency, not being a particularly large economy? – It would weaken the AUD, increase price inflation and put more pressure on already highly indebted households (=Deflation). – QE won’t work (at all) when all asset prices go down like we have right now here in Australia. Do you have the peak CoreLogic index values? I haven’t been able to obtain as the back series only goes back 12months. It would be interesting to see these same graphs for both All Dwellings and split into Housing and Units. I downloaded the data every month starting in 2017, and so I caught the last leg of the surge, the peak, and the decline since. CoreLogic gave me written permission to use this data and publish my charts based on it. I asked them for data going back years, but that’s a no-go. They’re selling that data. They’re not giving it away. Hi Wolf, great analysis but you’ve left out one very important a point: immigration. A lot of the new suburbs are highly socially “enriched” shall we say. Certain social pathologies come along with that and the end result is a very unappealing neighbourhood for the young family. I’m home buying age and I wouldn’t pay any money for a house in these developing ghettos. In an old (c1850’s) suburb of London – once a very pretty village indeed, then built up with the arrival of the railways – after the dismal and violent years of the 1970’s-2000, when it just went downhill with ‘enrichment’ of the kind mentioned, I was pleased to see, on a recent visit after many years, that young British and European families have, in a wave of ‘gentrification’, (ie dirt-cheap mortgages and well-paid jobs) driven the enrichers into the shadows. The public park is now a delightful sight with young families relaxing and totally safe, with dogs which might like you to death, but won’t jump at your throat like the large-jawed curs beloved of the enrichers. They came for the ‘large’ (in London terms) old houses and gardens – the sort of large gardens that modern ‘developers’ abhore but which normal people rather like. I do hope that these nice people can continue to pay their mortgages and that the social improvement continues. But even more juicy stuff with North American implications from Quebec. Quebec is proceeding to open up the taxi business to anyone with certain basic criteria and paying a basic business license fee. The taxi medallions, currently valued at 90 K (were more before Uber) are about to become worthless. The province has set aside 500 million C$ as compensation but of course the holders claim this is not enough. highly educated people who don’t realize that the privilege to operate a single taxi leases for up to 20 K a month in some locales. But the biggest impact in stocks will be for Uber and Lyft which have only sprung into existence because of the completely artificial shortage of taxis. The why part is simple the Chinese stopped buying. Yes, trouble in the middle kingdom.